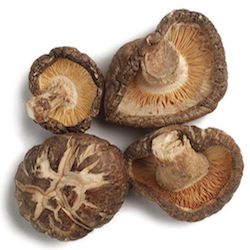 Only the button mushroom is cultivated more than the shiitake, which is prized by cooks and herbalists alike. Shiitake is a forest mushroom native to Japan, China and Korea. The Japanese name shiitake (shee-tah-kay) is derived from "shii" meaning the shiia or oak tree on which they grow and "take" meaning mushroom. Directions: Briefly rinse dried mushrooms in very cold water. Soak in a volume of warm water that is equal to twice the volume of the mushrooms. Let soak for 15-20 minutes, drain and use as desired.